Wont be too much longer and all those trees are going to loose thier wintery look! Have a great day Farmgirl. I found you via Lacy @ Farm Aspirations- I have really enjoyed reading your blog. Nothing makes me happier than to hear, read and/or see someone doing what they love best and it is obvious that you are. You have a beautiful place. well now i am confused. where did the shot of the piglets go or did i have your blog mixed up with another one? i thought there were a couple of piglets featured here. beautiful photography. Whitey the Chicken is, um, a well, a mixed breed. That sounds pretty good, doesn't it? She is actually my oldest hen, and I bought her at the only store in town. You know, the kind of place where you can fill up the truck with gas, pick up a candy bar, a gallon of milk, and a roll of barbed wire, rent a video, and buy a few chickens. : ) And Lindy is a Cherry Egger. The kind of chickenz we are is the kind of chickenz that can type. That's the kind of chickenz we are. Rare birds. But there are more of us all the time. Those cheapo "thrifty" birds sound like they're practicing over there. Perhaps you have heard of the "hunt and peck" typing method? Blogging poultry...the new wave. Its funny you should mention the "leafless" look as I studied the trees as I was driving and thinking about how "lacy" they looked. Got in my Kodak 340C today -- now to figure out all the bells and whistles. 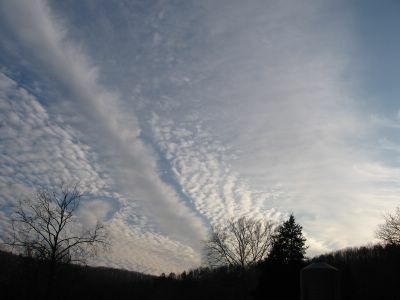 Buttermilk Sky! If someone didn't already say that.